Hello and welcome aboard the Australasian Close to My Heart Stamp of the Month Blog Hop. If you have arrived here from Megan’s Blog, Simple and Stunning then you are in the right place. If you landed here by accident, no problem, please join in by following the link at the end of this post. Today I would like to share with you a range of cards that I have made from the February Stamp of the Month Wild About Love S1402A available exclusively throughout February for $24 or for just $5 when you spend $75. For this blog hop I felt like one of the designers on Project Runway making a range of cards featuring this stamp set as opposed to one or two cards that I usually do. 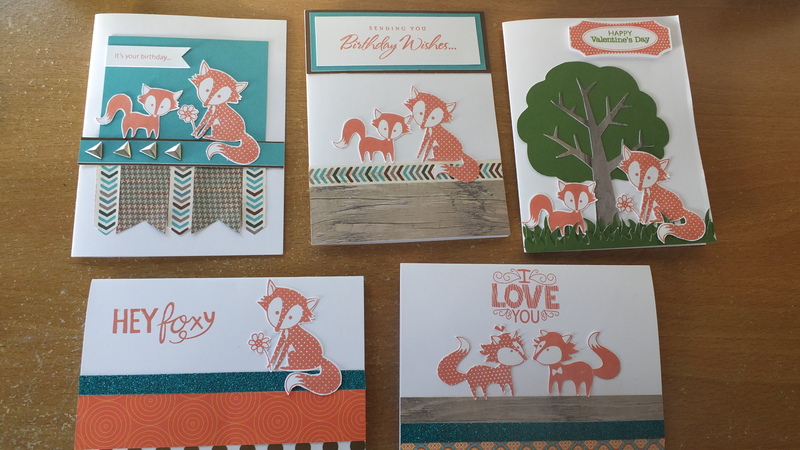 I love these little foxes and when I had have had some time on my hands in Craft Hutt I have enjoyed fussy cutting out these little critters. 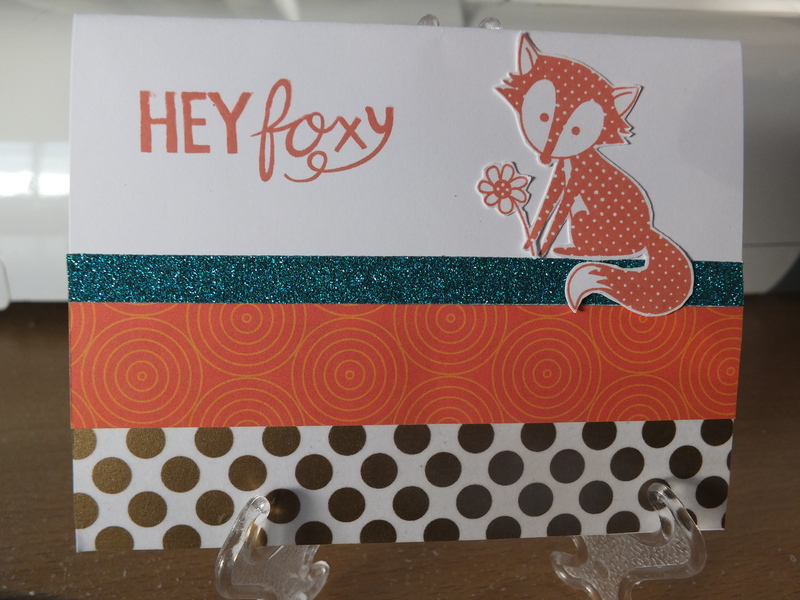 For this card I have used the lovely gold Polka-Dot washi tape, Cloud Nine paper and a dash of the new teal shimmer tape. Very simple but effective. 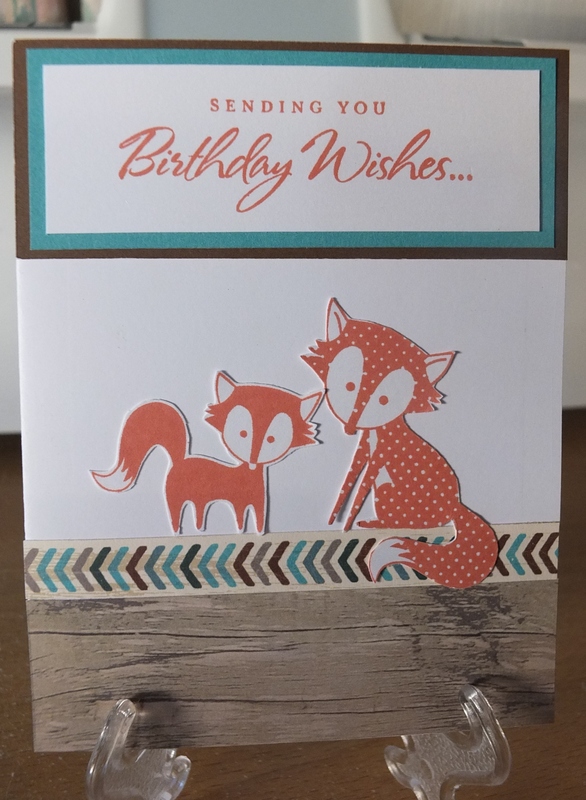 This card again features paper from the Cloud Nine cardmaking kit as well as the woodgrain from the Timberline paper pack. The teal shimmer tape breaks the two papers nicely. This is actually a single stamp, but I have cut them out separately. Very cute and apt for Valentines Day coming up too. I love this combination of colours here. I have used the strip from the Timberline paper pack to edge the woodgrain paper and picked up the Lagoon and Chocolate colours for matting the sentiment as well. Very peaceful. 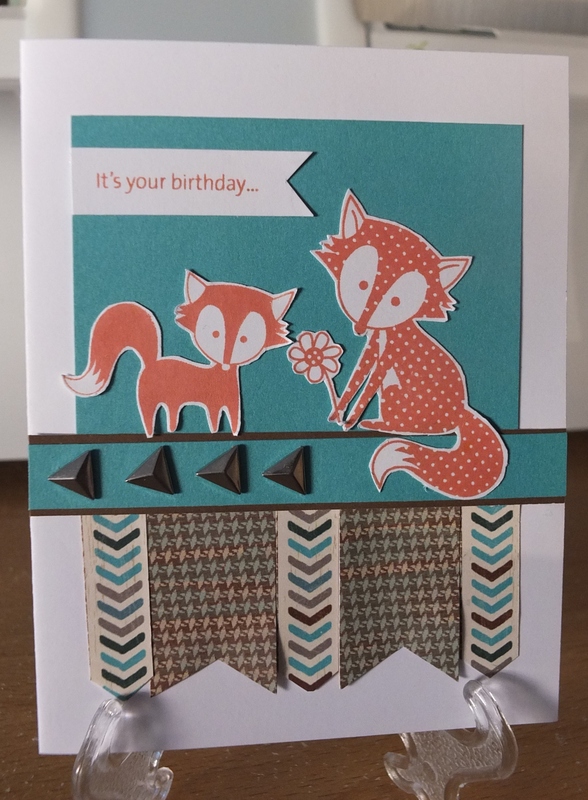 Another card using more papers and strips from the Timberline papers and matched with Lagoon and Chocolate cardstock. I have finished off with some triangle studs which will be available from today. 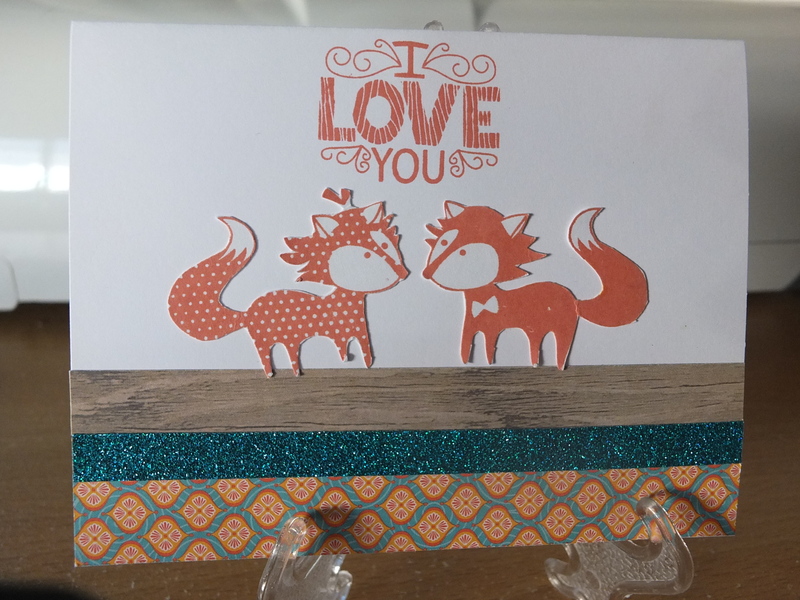 Finally for this card I used both the Art Philosophy and Artbooking Cricut cartridges to create a scene for the foxes. 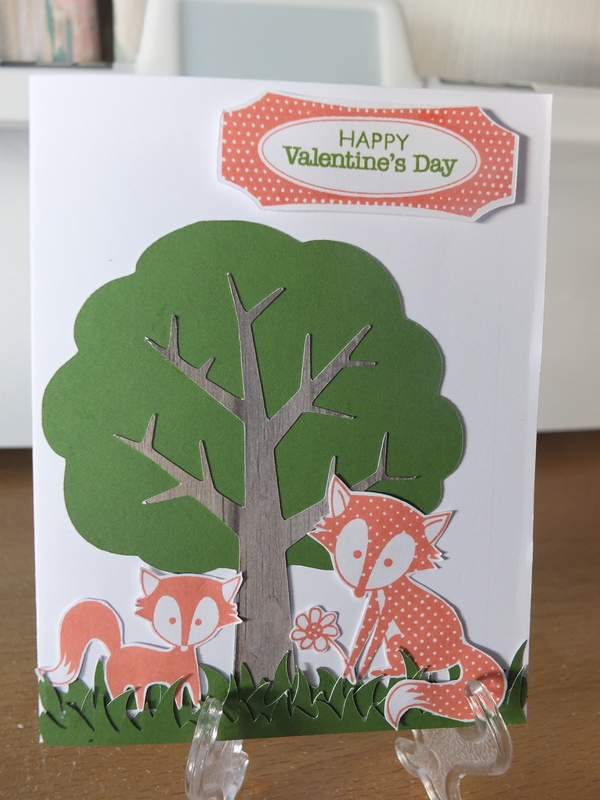 I have cut three strips of grass and layered them onto the card to make it look like the foxes were walking through the grass. The tree is from the Art Philosphy cartridge and for the trunk I have used the woodgrain paper from the Timberline range to make it look more realistic. The green cardstock is Topiary. Wild about Love is only available until 28th February from your CTMH consultant, so if you would like to know more please visit my shop here. I’d love you to leave a comment and a like before heading off to the next stop, Colour Creations with Natalie. Lovely cards. I especially like the ones using Timberline! You’ve been busy Patricia! They’re very cute. A lovely collection of cards Patricia. I hate fussy cutting but the micro tip scissors do make it so much easier. These are great Patricia, love the way you have used the stamps. Such fun cards, very creative. I love all your Cricut cutting – especially that tree! So appropriate for foxes. Great cards Patricia. BTW, I found your blog via CTMH Consultants Blog Challenge and Support Group.